I just had an interresting experience in my hotel room in Denver. I linked up to the wireless network to check mail and update podcasts. 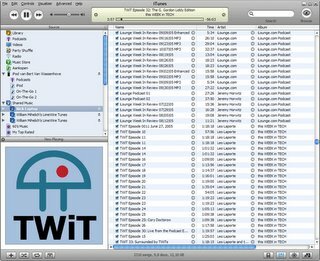 Upon opening iTunes I noticed that two more people on the network had iTunes opened, with the music sharing feature on. I connected to Nick's laptop (who is Nick?) and checked out which podcasts he had ... he's a geek, so much is clear. Now, this is interresting. I really feel like talking to this guy, his choice of music is orginal, he has some interresting podcasts on his laptop, we could have an interresting breakfast conversation. Is there an opportunity for Apple here? Just add a small IM feature and I can have a chat with Nick. On the other hand, this means the whole hotel can now see my music, podcast and video podcast collection ... eeuh ... need to get disconnected I think :-). And Nick obviously left for breakfast (he's no longer online, the podcast I listened to stopped), probably a good idea to do the same. Bye.